Oriental Antiques from John & Rico Drawing Room of Newport located in Historic Newport, Rhode Island including Satsuma, Imari, Kutani, Kinkozan, Ivory, Okimono China, Chinese, Japan, Japanese. Item # 4960. 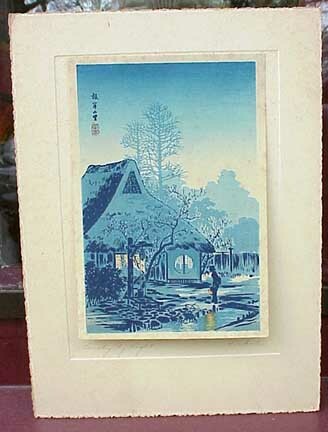 A woodblock print byTakahashi Shôtei Signed by the artist. Size of the print: app. 13cm x 19cm. Condition: apparent foxing in the lighter sky area. Mounted on cardboard with the hand written title: " Country by Night" and the name: "Rakutei". I believe the correct title for this woodblock is: "Country house at Negishi".Stamped on the back of the woodblock: "MADE IN JAPAN". Price: $350.00.